1. Ridiculous because of being irrational, incongruous, or illogical: Louis thought it was an absurd idea to go to the movie so late. 2. Lacking any meaning that would give purpose to life: The young woman's absurd lifestyle seemed pointless and worrisome to her parents. 3. The condition of living in a meaningless universe where life has no purpose; especially, as a concept in some twentieth-century philosophical movements: Jeremy, the university student, was determined to study the seemingly absurd lives of famous poets who had died young. 4. Relating to, or manifesting, the view that there is no order or value in human life or in the universe: The absurd theory about the meaninglessness of human existence did not appeal to James when he was attending the special lecture presented by a religious leader. 5. Out of tune, incongruous, senseless; so clearly untrue or unreasonable as to be laughable or ridiculous: The absurd quality of the theater production seemed to confuse the critics who were not sure if the drama was serious or just a joke. Something is absurd when it is contrary to the first principles of reasoning; such as, a part of something should be greater than the whole is considered to be absurd. Being monstrous and preposterous both refer to what is overwhelmingly absurd. 1. Having or expressing the belief that human existence and behavior are meaningless; that is, unreasonable or impossible to believe: Dr. Smith, the scientist, could not present an acceptable rationale for his absurdist statements regarding the violence of people in different societies. 2. A reference to or concerning that which is inconsistent with reason, logic, or common sense: The absurdist student told his teacher that the dog had eaten his homework. 1. Someone who considers something as being extremely silly, unreasonable, or foolish: Ted's lawyer claimed that the charges made by the absurdist in the police department were obviously unfounded because Ted was in another country when the crime was committed. 2. A person who acts or presents characteristics of being ridiculous: Mr. Potter, the politician, was described by some people as another in a series of absurdists who were candidates for mayor. 1. Ridiculousness because of being irrational, incongruous, or illogical: Absurdities of life in the city were depicted on the new mural painted on the wall of the city hall. 2. Anything that is considered to be lacking in order and meaning: For some students, mathematics is an absurdity and is an illogical process. 1. Characterized by being obviously and flatly opposed to manifest truth. 2. Inconsistent with the plain dictates of common sense; logically contradictory; nonsensical; ridiculous. 1. A message whose content is at variance with reason: The absurdness of the letter from the bank was confusing to Joan's uncle. 2. Ridiculously unreasonable, unsound, or incongruous: Mr. Anderson, the drama teacher, commented about the absurdness of the new play which was being developed by the students in his class. 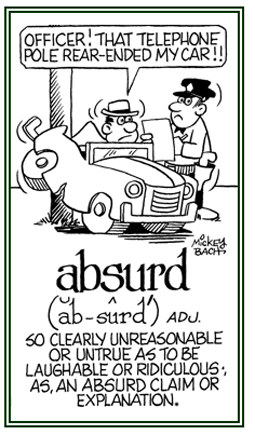 A reference to an argument demonstrating the ridiculousness of an opponent's proposition: "To what is absurd; to the point absurdity or inconsistent with obvious truth, reason, or sound judgment." An appeal pointing out the illogical points of view as presented by an opponent; rather than by establishing the merits of one's own position: "Argument to absurdity, or statements the contents of which are not reasonable or that are considered to be ridiculously foolish." I believe it because it is unreasonable. This is an expression of the justification of one's faith on the basis that there is no need to understand: It is the essence of faith not to seek a rational explanation in matters that are spiritual. This statement of belief is also given as Credo quia impossible est, "I believe it because it is impossible." 1. A consonant produced without sound from the vocal cords. 2. In mathematics, an irrational root or irrational number, or an expression containing one or the other. 3. Uttered, as an element of speech, without tone, or proper vocal sound; voiceless; unintonated; nonvocal; atonic; whispered; aspirated; sharp; hard, as f, p, s, etc. ; opposed to sonant. 4. Etymology: from Latin surdus, "unheard, silent, dull"; possibly related to susurrus, "a muttering, a whispering". 1. Dramas stressing the irrational or illogical aspects of life, usually to show that modern life is pointless: The politician, Mr. Douglas, suggested that the latest election results were nothing more than a theater of the absurd. 2. A form of drama that emphasizes the absurdity of human existence by employing disjointed, repetitious, and meaningless dialogue, purposeless and confusing situations, and plots that lack realistic or logical procedures: Mrs. Willson, the drama teacher, told her students that the theater of the absurd, that they were expected to perform, should emphasize the main character's isolation in a bizarre and meaningless world.